Nicki Stieda grew up in Vancouver, BC. After graduating in Violin performance from the University of British Columbia she moved to the Netherlands to continue her studies in Amsterdam with the renowned teacher Herman Krebbers. She played full time in the Netherlands Radio Orchestra for fifteen years prior to returning to Vancouver. In Canada Nicki has had an active career, playing regularly with the Vancouver Symphony Orchestra, the Vancouver Opera Orchestra, the Pacific Baroque Orchestra, the Royal Winnipeg Ballet touring Orchestra, as well as other freelance work and chamber music. A dedicated teacher, Nicki also enjoys coaching chamber music and being actively involved with the Vancouver Youth Symphony Orchestra. 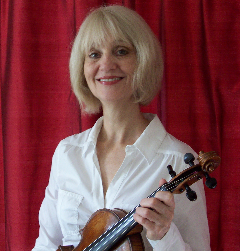 She has adjudicated at various festivals in the lower mainland since 1995.